HUD 223(f) Loans — Commercial Real Estate Loans, Inc. In today's market, the HUD 223(f) loan is one of the most cost-effective methods to purchase or refinance a multifamily property. In recent years, the 223f program has become increasingly popular due to the fact that it offers long loan terms, high leverage, and competitive interest rates. On top of that, 223(f) loans are also non-recourse. Despite that, many investors and developers still believe that the HUD 223(f) loan is just for affordable properties or non-profits. However, this simply isn't the case. While affordable properties do get some additional benefits under the program, a HUD 223(f) loan is also an excellent way to buy or refinance market-rate multifamily properties. At Commercial Real Estate Loans, Inc., our experienced mortgage bankers can to guide you through the entire HUD 223(f) loan process and help you achieve a successful closing. Cash Out: For 223f refinances, cash out is allowed under specific conditions. LTV must be at least 80% (including transaction costs in the loan amount). At that point, 50% of funds above 80% adjusted LTV are released, with the remaining 50% to be released after property rehab is complete. Repair Limitations: While the 223(f) program is not intended for substantial rehabilitation, loan funds may be used for repairs of up to $6,500/unit (more in high-cost areas), or 15% of the property value, or 20% of the mortgage. If the second or third calculation is used, repairs are limited to $15,000/unit (more in high-cost areas). No more than half of any essential structural component (e.g. roofing, HVAC) may be replaced. In addition to paying regular fees like MIPs and paying for annual audits, investor/developers using a HUD 223(f) multifamily mortgage will also have to pay for third party reports, including FHA/HUD appraisals, environmental reports and market studies. Plus, they'll also have to pay other costs, including FHA inspection fees, title and recording fees for the property (for acquisitions), as well as any associated legal costs. Despite those extra fees, if a property has a certain number of affordable units, it may qualify for low income housing tax credits (LIHTCs), nearly $8 billion of which are available each year from state and local government agencies. There are two general types of credits, 4% credits and 9% credits. HUD 223(f) affordable housing acquisition projects are typically eligible for the 4% credit. The 9% credit is usually reserved for the new construction or substantial rehabilitation of affordable housing projects. 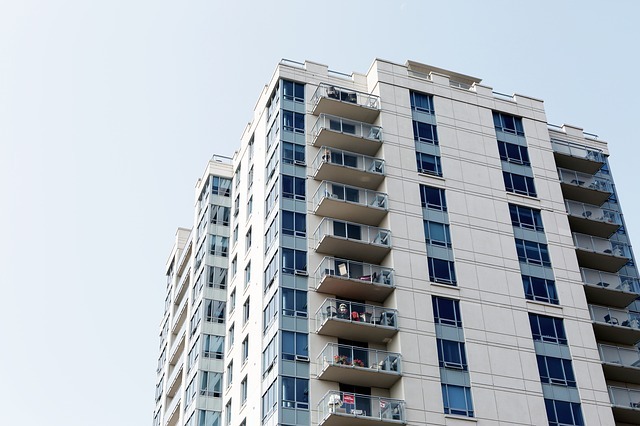 While FHA 223(f) loans are primarily intended to offer financing for multifamily apartment properties, the 223(f) program does allow a certain percentage of a property to be occupied by commercial space. Specifically, the program allows for up to 20% of a property’s total net rentable area to consist of commercial space, or, alternately, up to 20% of a property’s effective gross income (EGI), to be derived from commercial tenants. While parking fees for residents do not count towards a property’s commercial income limits, parking fees paid for by non-residents does. In some situations, HUD’s commercial space limitations may be waived, but only under certain conditions. For example, if the property is supporting specific goals of HUD, such as transit-oriented or sustainable community development, or, if the commercial aspect of the property has a long-term lease with a credit-worthy tenant, the limitations may be waived. In general, waivers will only be issued if the property has ample cash flow and the local market supports the need for commercial development. However, in order to qualify for a waiver, borrowers must ensure that both the appraisal and the market study are prepared by experts with significant experience in the type of commercial space that the project will contain. These must include estimates of commercial rental income, as well as detailed reports on local commercial vacancy rates, tenant roll-over risk, lease-up costs, and other variables that may impact the risk of the project. Plus, any commercial tenant that exceeds 5% of a property’s effective gross income (EGI) will need to undergo a separate credit analysis. Unfortunately, even borrowers in which the sponsor operates under a “master lease” structure must typically follow these rules. To learn more about the exact commercial space limitations and rules for FHA multifamily loans, click here for the official mortgagee letter from HUD. Commercial Real Estate Loans, Inc. is the partner you need to help acquire or refinance your next multifamily or commercial real estate project. Whether you're a small startup or an established company, we have the knowledge and experience to give you more financing options!